The month of May is, without a doubt, the most exciting time for all #foodies. Why? – you may ask. Well, it just so happens to be when the renowned Los Angeles Times gives Los Angelenos a month-long celebration of food, food and yes, more food! 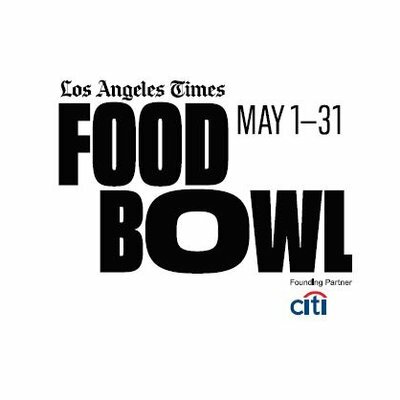 From May 1st through May 31st, the Los Angeles Times‘ LA Food Bowl will be taking place with almost 200 incredible events that are bound to make your mouth water. The food festival is back for its third year with even more excitement for foodies to enjoy and we can already tell that this year’s LA Food Bowl is going to be even bigger and better than years before. The Los Angeles Times just recently revealed the line-up for the third annual LA Food Bowl and our stomach is starting to growl just thinking about all of these amazing events. Throughout the month, magnificent panel discussions, dining events, chef collaborations, volunteer projects and food and drink-inspired happenings will be taking place. There will be special appearances by highly-acclaimed chefs and great opportunities to munch on some delicious treats – all in celebration of the cuisines and people of Los Angeles. Do you love tacos? Well, there’s an LA Food Bowl event for you on May 9th! Are you all about the burgers? If so, make sure you mark your calendar for a burger-filled LA Food Bowl event on May 11th. Do you constantly find yourself craving Filipino food? Then, the Filipino Garage Party on May 18th is the event for you! Needless to say, there is a countless amount of sensational events for food-lovers to enjoy, so be sure to gather up your family and friends to take part in all of the Food Bowl fun. Two events that everyone should keep an eye out for include LA Food Bowl’s Opening Night celebration on April 30th and the Night Market from May 8th – May 12th. Why wait until May 1st when you can kick off the LA Food Bowl one day earlier on April 30th during Opening Night? Opening Night will feature chef Enrique Olvera and L.A. Times Food Editor Peter Meehan’s program that shows the culinary and cultural relationship between Mexico City and Los Angeles. The Mesamérica L.A. event will begin at the Million Dollar Theatre and following that event, the party continues with DFiesta at Grand Central Market and La Cita Bar, where attendees will be able to continue to enjoy Mexico City-inspired festivities. Night Market is one of the LA Food Bowl’s most renowned and anticipated events. Night Market takes place over five days where guests can stop by food vendors, listen to musical performances and experience excellent, chef collaborations. According to the press release, “Enrique Olvera (Pujol, Mexico), Daniela Soto-Innes (Cosme, USA), Norma Listman and Saqib Keval (Masala y Maiz, Mexico), Gaggan Anand (Gaggan, Thailand), Virgilio Martínez (Central, Peru), Koji Kimura (Sushi Kimura, Japan), Angela Dimayuga (The Standard International, USA), Rodolfo Guzmán (Boragó, Chile), Musa Dağdeviren (Çiya, Turkey), Andrew McConnell (Cutler & Co., Australia), Dominique Crenn (Atelier Crenn, USA), Yu Bo(Yu’s Family Kitchen, China), JP Anglo, (Sarsá, Philippines), Tom Cunanan (Bad Saint, USA), Aaron Franklin (Texas), Pat Martin (Tennessee), Bill Durney (New York), Sam Jones (North Carolina) and Charles Michel (Oxford University Research Laboratory, Great Britain)” will all be visiting the LA Food Bowl. Take a look at a few of the many highlights from this year’s LA Food Bowl line-up below and see the full list of events at LAFoodBowl.com. Comment below and tell me or tweet me at @alexisjoyvipacc, which LA Food Bowl events are you planning to attend? Mesamérica L.A.: The festival’s opening night event on April 30 is the first incarnation of chef Enrique Olvera’s celebrated symposium to be held outside of Mexico. Olvera and L.A. Times Food Editor Peter Meehan have put together a program to explore the culinary and cultural interconnectedness of Mexico City and Los Angeles. DFiesta: Following Mesamérica L.A., the opening night festivities continue with DFiesta at Grand Central Market and La Cita Bar featuring chef collaborations, roving Mariachi bands and other Mexico City-inspired merriment. An opening night celebration featuring collaborations from L.A.’s top restaurants and international guests. Collaborations include: Bavel, Kismet X Ciya, Shibumi X Spago, Scratch Bar and Kitchen X Ari Taymor, Fiona X Cicatriz, Chengdu Taste, The Bazaar X Otono, and Otium X chef Edras Ochoa. Featuring Sonoratown, Tacos 1986, Chichen Itza, Broken Spanish, Teddy’s Red Tacos and Guerrilla Tacos. Featuring Chef Kang’s Food Rehab for Super Foodies, Lucky Bird, the Crack Shack, Night + Market, Hotville Chicken and Phat Birds. Featuring HiHo Cheeseburgers, Banh Oui, Everson Royce Bar, Hank’s, Bowery, Love Hour and Belcampo Meat Co. Featuring Iki Ramen, Lukshon, Porridge & Puffs, Baroo, Hui Tou Xiang, Chongqing Special Noodles, Sea Harbour Seafood Restaurant and Little Sister. Join Adam Perry Lang and the team from L.A. Times Food as they showcase the best BBQ in L.A. featuring pitmasters Aaron Franklin (Texas), Pat Martin (Tennessee), Bill Durney (New York) and Sam Jones (North Carolina). Local participating restaurants include Bludso’s, East LA Barbecue, Horn Barbecue, Kra Z Kai’s and SLAB / Trudy’s Underground BBQ. Effervescence: Join us May 3-5 for America’s most comprehensive epicurean event centered on Champagne and sparkling wines. From legendary tête de cuvée Champagnes and California’s finest fizz to international bubbles produced around the world, Effervescence brings them all to you in one epic Los Angeles weekend of celebrating bubbles. Vespertine Symbios: A collaborative tasting menu on May 5 will feature dishes by chefs Jordan Kahn (Vespertine), Dominique Crenn (Atelier Crenn), Virgilio Martínez (Central) and Niki Nakayama (n/naka). The Future of Food in Extreme Environments: A panel discussion on May 7 where scientists and chefs will explore how to grow food in space and how to establish a food culture in a new environment. Filipino Garage Party: Angela Dimayuga, the creative director of food and culture at Standard International, will bring together chefs including Russell Victorioso (Café Birdie), Chad Valencia (Lasa), Tom Cunanan (Bad Saint) and JP Anglo (Sarsa) to create a perfect plate of Filipino food on May 18. A Tutta Pizza: Enjoy all-you-can-eat slices and styles from New York to Chicago, and Roman to Neapolitan on May 19. There will also be panels and Q&As, cooking demos and culinary workshops. L.A. Chef Conference: This all-day event on May 20 will feature speakers, panelists and cooking demos from the restaurant industry, for the restaurant industry. Outstanding in the Field: A series of long-table feasts in spectacular locations including the L.A. River and Weiser Family Farms. Pasta Masters: On May 30, Los Angeles chefs and pasta makers from Italy will showcase imported, authentic Italian ingredients during hands-on culinary demonstrations. GUSH Party at Mmhmmm: A late-night GUSH Party for femme-identifying individuals, people of color and the queer community. Originated in New York, this edition of GUSH Party will celebrate intersectionality and the culinary community in Los Angeles on May 31. Previous Article: 5 Reasons Why We Can’t Wait To See Netflix’s “No Good Nick” Premiering April 15th – Watch The Trailer Here! Next Article: Nickelodeon’s New Pre-School Series “Ryan’s Mystery Playdate” Is Bringing A Whole Lot Of Fun To Families Starting April 19th!